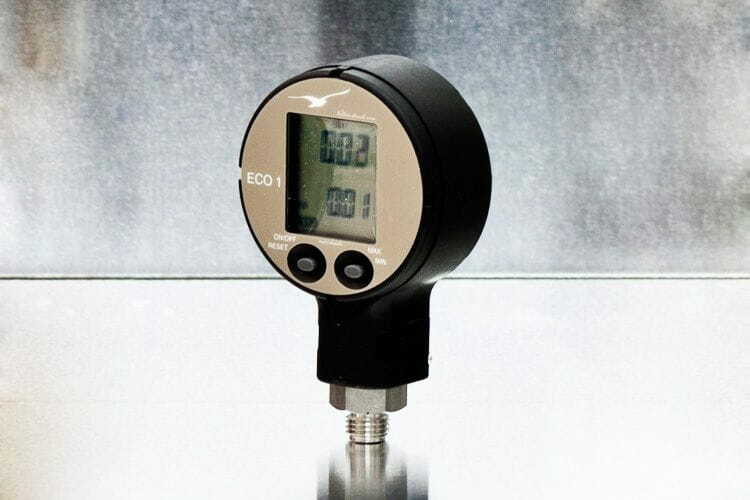 The LEO2 digital pressure gauge is based on a piezo-resistive transducer, controlled by a high accuracy microprocessor which read the given values and make the correspondent operations. The pressure is measured twice a second and displayed. The upper display indicates the actual pressure while the lower one displays the maximum and minimum values performed since last reset. This pressure gauge has two buttons: the one on the right switches the manometer on, (on/off function). Once switched on, if the button is pressed and maintains pressed, different functions are displayed. The actual function will be performed when released. The button on the left is only used to switch the maximum and minimum values performed. In addition, this model offers the possibility of selecting the measure units among the following ones: bar, mbar, KPa, MPa, psi & kp/cm².